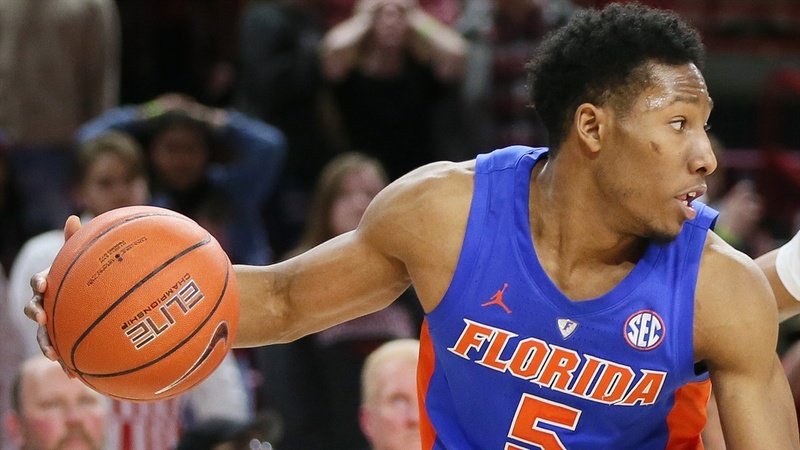 The Florida Gators (12-8/4-3) defeated Ole Miss (14-6/4-3) 90-86 on cold Wednesday evening in the Exatech Arena. The win puts the Gators above .500 in league play and comes courtesy of grind it out game that saw both teams trade shots all night and in an overtime thriller that kept the O-Dome rocking. Instant Analysis takes a closer look at the win. WHAT WENT RIGHT: This game was so close in regulaltion that the basketball spirits didn’t see fit for it to end there. The Gators played the Rebels close all night, finding ways to overcome a free throw defecit (Ole Miss shot 85% to Florida’s 77%) and being outrebounded 41-27, and working instead with things like Noah Locke going 6-11 from beyond the arc with a team leading 22 points and Kevaughn Allen taking over late in the game (more on that below). The Gators were willing to play to the pace the Rebels dictated and didn’t back from it, instead finding a variety of ways to keep the offense moving while letting the defense keep them in it on the other end and sending it in to a thriller in overtime. There the Gators absolutely controlled the first three minutes, let Ole Miss cut into a bit out of a timeout, then threw themselves all over the floor to keep the ball with under a minute to go. A trip to the free throw line all but sealed the deal from there. WHO STOLE THE SHOW: It was a big night for freshman Keyontae Johnson who had 15 points and six rebounds. He was all over the court as well, pitching in with a variety of ways. But this was Kevaughn Allen’s night. He took over late in the game, building his 21 point performance. He hit an ice cold three with 2.5 seconds to go in regulation, making it a tie game at 76. He then stole away the long inbounds from the Rebels sending the game to overtime. There he hit back to back shots that gave the Gators the boost they needed to to take over the free period. He ended the night going 8-8 from the free throw line and with five assists. THE NUMBERS DON’T LIE: White has found a lineup that works with his young freshmen, but on Wednesday night, he got some much needed veteran leadership from Kevaughn Allen and Jalen Hudson. For so much of the season the two have had trouble co-existing on the floor together but against Ole Miss, White let the duo work together to end the first half and it paid off. For the first 14-25 of the game, the Gators slightly edged the Rebels 19-18. At the 5:35 mark, Allen subbed back in, joining Hudson. The two ran point for the remainder of the half, moving guys around to keep things clicking and the Gators doubled the Rebs on a 14-7 run to head to the locker room with a lead. BOTTOM LINE: This was an encouraging game for a team that all too often this season would go cold for extended periods of time. Against the Rebels, Mike White’s squad kept it close against a good team and took the shots they needed to instead of trying to live at the 3-point line. The game was a defensive grind in the first half and required trading shots in the second. For the most part, Florida was able to do both before taking over in overtime to notch the much needed win. UP NEXT: The league grind continues with the No. 7 Kentucky Wildcats (17-3/6-1) arriving in Gainesville for a date Saturday. Tip off is set for 4pmET on ESPN. White's original plan was to go for 2 at the end of regulation then changed it to a 3 right before timeout was over. Very smart of him to change that strategy. Much easier to get a decent three off with 8.8 seconds left than with 2 seconds left. Although...it was a contested shot. Obviously it's so easy to talk about the Allen three at the end of the game, but in a tie game, every bucket technically counts the same. The play that impressed me the most was in the middle of the 1st half that probably went overlooked by most. Kevarrius Hayes got the ball in the post, backed a defender in and hit a hook shot from the low block. I've watched probably every game of his career at UF and have never seen him be strong in the paint (on offense) like he was on that play. Hopefully that was a confidence builder and we see some more post presence out of him. Yea I remember exactly which play you're talking about. I even wrote about it in my notes because it stood out when it happened. He seemed to have a plan the whole time and wasn't just throwing himself in there and seeing what happened.